Design and preview in Espresso, or with the newest browsers. Xray and CSSEdit tools for all. OMG. Browser Preview and Xray. Local project? Enjoy the best auto-refresh in the business. Xray your page layout to quickly edit relevant styles. The best part? It works in Chrome, Firefox and Safari (including Technology Preview). Overrides with Live Styling and Xray. Change CSS for live sites and see your design update in real-time. No need to publish, reload or even save. Only Espresso makes playing with live projects this fun, easy and non-destructive. CSSEdit Tools for Supercharged Style Sheets. The new Espresso lets you build first-class standard CSS, but also modular SCSS and LESS. Styling is a joy with the beautiful Navigator, auto-building by Dynamo and incredible integration with Live Preview and Overrides. Our award-winning CSSEdit visual tools and code formatting live on inside Espresso, with frictionless editors for colors, gradients, shadows, layouts and more — available for standard and dynamic CSS. Everything just works. 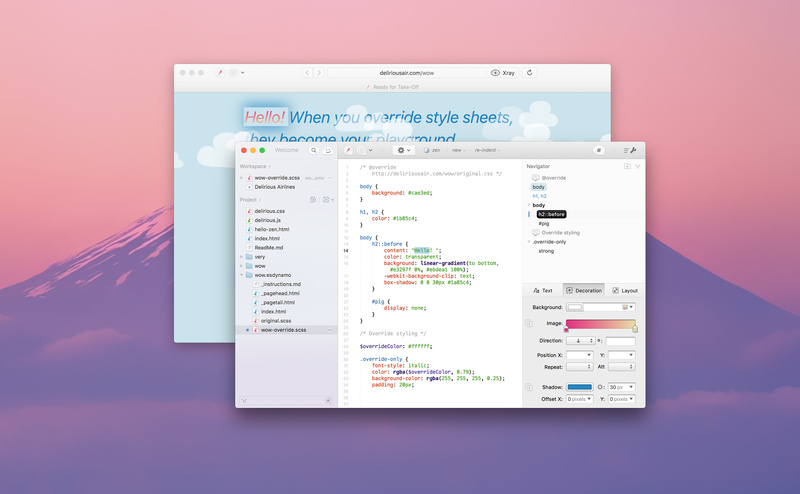 A powerful text editor to rock your code, in a workspace that fits your workflow. Zen Snippets. Zen shortcuts let you combine and expand abbreviations based on tags and custom snippets. Toolbar Favorites. Customize your toolbar with contextual actions, snippets and menus for quick access. Templates. For files, folders or projects. Use a built-in one, or save your reusable bits. A real time-saver. Workspace. 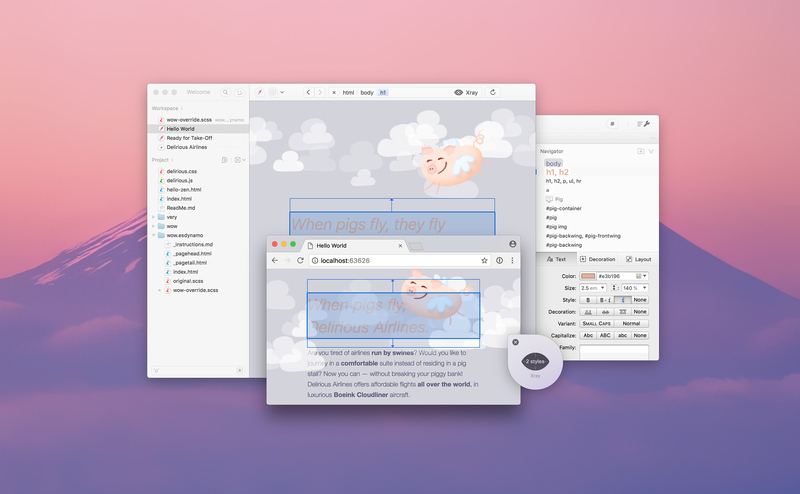 Now with the flexibility of tabs while integrating even more smoothly with your project files. Open Quickly. Switch between documents without taking your fingers off the keyboard. It's Go time. Solid Basics. Zippy editing. CodeSense. Folding. Indentation guides. Bracket balancing. All there, quietly helping. Multi Edit. Make many changes at once, not one change many times. Multiple selections make renaming things a breeze. Navigator. No mere function menu. 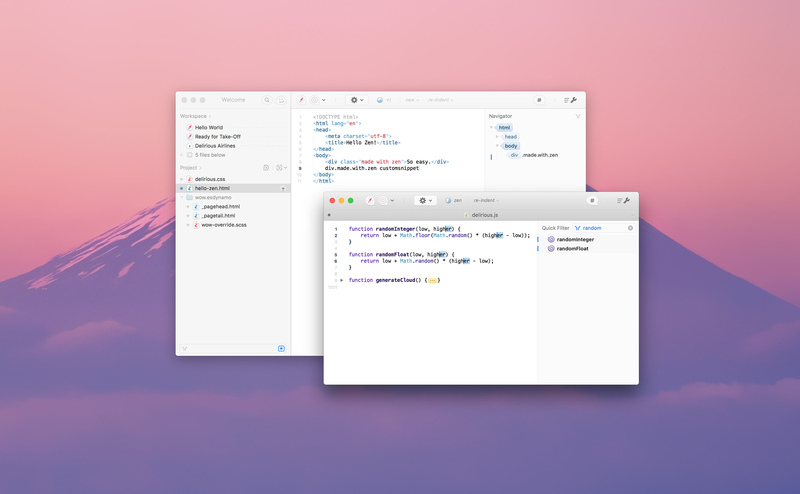 Effortlessly navigate your code structure with groups, style previews and Quick Filter. Language Support. Out of the box: HTML, (S)CSS, LESS, JS, CoffeeScript, PHP, Ruby, Python, Apache and XML. Extensible with syntax plug-ins. Fantastic Find. Needle and haystack no more. Project Find and Replace, Quick Filter and colorized regex make searching through files or text a breeze. Plug-In Power. Espresso comes with an extensive plug-in API for actions, syntaxes, formatting, and more. Check out the Power Up section. Build fanstatic sites with Dynamo. * Or just one file. The Dynamics of Static. We dig the inherently secure speed of static websites, and the convenience, reusability and flexibility in dynamic content systems. So, we started Dynamo: Espresso's built-in build infrastructure. It elevates the languages you know and love, producing content without server requirements. Opt in and discover auto-building with unrivaled Live Preview integration where you need it most. Superb CSS. SCSS and LESS are popular for their nested rules, variables and functions. Espresso has fantastic support, even when using them with Preview Overrides. Markdown and HTML. Reuse page components with imports and smart paths. Generate entire folders with template mixins (our blog!). Learn more about advanced Dynamo features. * In-App Beta. Advanced CSS support is solid and absolutely dynamite, but we're still evaluating some features like folder template mixins. They may change significantly later. The friendly face of server supremacy. Say Hello to Clodette. With Quick Publish, Server Sync and Quick Browse, you have the right tools for all your publishing needs. Ready for action in the new Clodette overview menu. Server Sync. Keep entire projects in sync with their server. Also pushing a specific folder to a CDN? No problem! Cloud Attack powers super-fast change detection and parallel transfers. App-Wide Favorites. Server credentials are now saved globally — or not at all, ideal for one-off transfers. Many sites on one server? 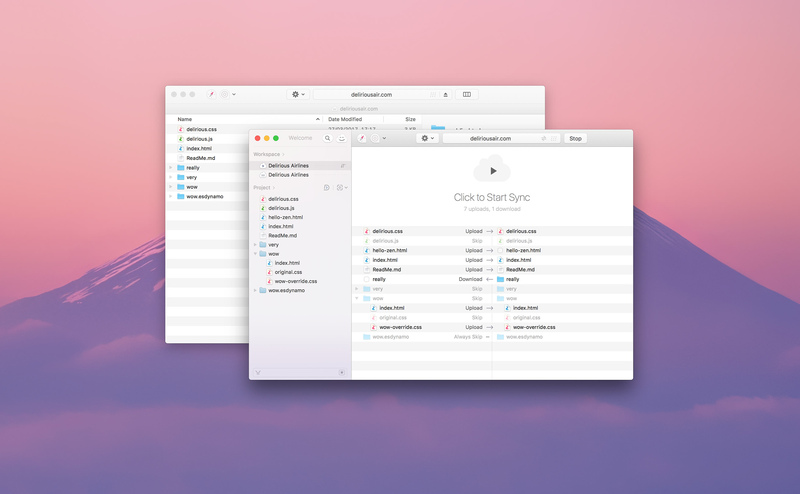 One favorite can power multiple Project Servers, each connecting to its own folder. Quick Publish on Save. Introduced way back, auto-upload-on-save is still a goodie. Use the action menu for more manual control. All seamlessly integrated with your Project Servers — project-wide or folder specific. Everything comes in the box, so you're free to think outside it. Try today.